I was in high school in the '90s when oversized, baggy jeans were all the rage. But for a long time now, slim-fitting denim has been the only thing in style. As a 30-something mom of two, I fully welcome the return of the slouchy, distressed trend. But does it look frumpy? It doesn't have to. Even before I had babies, the tummy was my trouble spot. This might have something to do with my intense love of sugar. I'm not going to think too hard about that. But while it was fairly easy to disguise with blouse-y shirts or flowing dresses, the popular low-rise denim trend has never been my friend. I've made peace with it, and have found skinny jeans that fit and flattered, but when the “boyfriend jean” became acceptable as part of a cute outfits, I was ecstatic. It varies by brand, but the basic idea of the boyfriend jean is baggy in the rear, straight-legged through the thighs, rolled at the bottom, and usually distressed. As long as it doesn't go to an extreme, this fit can be very comfortable and extremely forgiving. The trick is to look cute in menswear, and not like you're about to paint something. 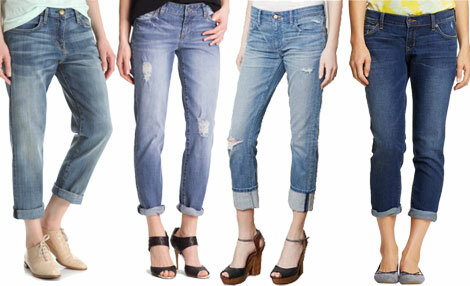 Because boyfriend jeans are inherently casual, it's best to wear something nicer up top. Look for shirts or sweaters that are tailored or form-fitting so that you don't appear completely shapeless, and add feminine touches where you can. A pretty statement necklace offsets the distressed jeans, and bright lipstick makes the look cute instead of tacky. Heels or wedges really take boyfriend jeans up a notch, but if that negates their comfort, then stick to ballet flats or sandals. Current/Elliott boyfriend jeans ($206) are very well-liked by the fashionable crowd. They're really baggy, and expensive. But their color and style are right on trend. Kut from the Kloth “Catherine” jeans ($79) are a good price point and have just the right amount of distressing in the legs. Pilcro Hyphen Relaxed jeans ($118) are what I'm wearing in the photograph. They are the softest denim and have a really cute fit. Old Navy Cropped Skinny Boyfriend Jeans ($35) have less distressing and the slightly darker wash makes it a little dressier and more versatile. And the price point is perfect. ^ Who knows how long the loose-fitting denim trend will hang around, but I want to enjoy it for as long as I can. It's a casual and comfortable option for fall.